For monitoring your entire Infrastructure (comprising of numerous servers) with ease & efficiency, we provide you with the facility of creating Sub Users. For dividing the Infrastructure-Monitoring Load, a Registered User can create multiple Sub Users as per his / her chosen plan(package). 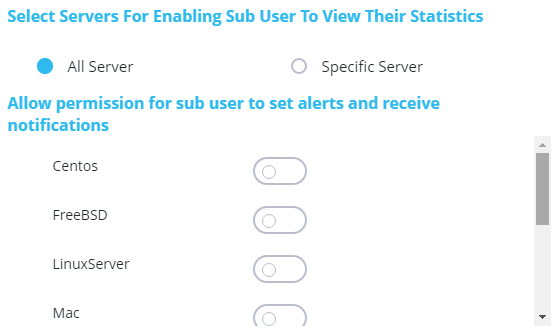 When adding Sub User, he / she will be given Access to either All Servers or Specific Server(s). Further, among the accessible Servers, he will be given / restricted Permission to access the Alerting Functionality.